Published: July 2018 - Wildfire. Triggers/Content Advisory: Sexual innuendos / strong language. You'd know if you were lying to yourself, wouldn't you? When Jess Tidy was Mark Winter's student, she made an accusation that ultimately saw him sentenced to three years in prison. A jury found him guilty, but he always maintained his innocence. Now, Jess's mother's death has brought her back to the village where she grew up, and where Mark still lives with his wife. And the truth about that night ten years ago which nearly destroyed them both is finally going to come out. Unfortunately, this is one of those books that I knew from the first chapter wouldn’t be getting 5 stars. I didn’t love the writing; it’s very boring and too impersonal. The dialogue is also extremely weak. The characters have no depth. Karen is the most compelling, but even she is easily forgettable and half-fleshed out. Because I wasn’t excited by the characters, I couldn’t care about their story. The relationships also feel too cliche and contrived. You'd know if you were lying to yourself, wouldn't you? The plot is unstructured and poorly paced. Apart from being bored, I also tossed and turned on the indecisive themes the author couldn’t seem to nail down. I think she was trying to make a few points, but by the end I honestly had no idea what the point of the story was. The plot’s too clumsy to make an impression. I also found a few incidents implausible. For example, there’s the document Karen discovers on Mark’s computer. We’re apparently supposed to believe that ten years after his case etc etc, he suddenly decides to start writing about his encounters with Jess leading up to The Incident? It’s too convenient for the story, too random; too convenient for Karen to then stumble upon and read chapter by chapter until she gets to “The Twist.” It’s lazy, because that is drawn out for no reason. It’s not clever - nor is it tense. 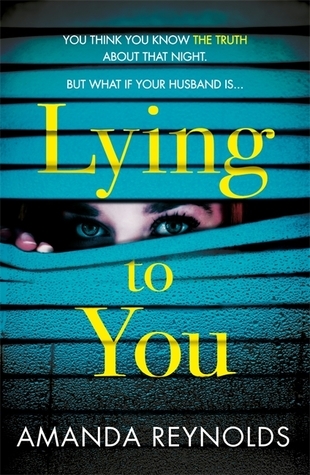 Lying To You isn’t half as gripping and tantalizing as it claims to be. The sloppy plot and cliche characters do it no favours. Bardugo is one of my favourite authors. The amazing thing about these new editions, apart from the gorgeous covers, is also the awesome bonus content inside. There are interviews with Leigh about her writing process and this specific story and characters, a sneak peek of Six of Crows, and lots more. Please read this trilogy! And get these editions! They're incredible. I love Leigh Bardugo's writing. But her style in this book is quite different from what you might have read in her other books, notably the Six of Crows duology. The pov is first person past tense, from Alina's perspective, and there's a lot of telling instead of showing. For the first book, especially, Bardugo seems to struggle to get inside Alina's head. The perspective is rather removed. The writing certainly improves as the series continues, and the dialogue is always flawless; witty, funny, emotional, banter on point, it's all wonderful. But the telling instead of showing is frustrating. The one big issue I have with the series' plot overall, is that Alina doesn't necessarily drive it. Most of the time it isn't actually her choices and actions that bring about the incidents and move the story forward. Sometimes they're just random, or other characters get involved. I wish Alina was "more to blame" for everything that happens. But despite the issues, every book is still immensely fun and entertaining. I love the characters. I think they're the highlight of the series. With Bardugo, there really are no small characters; everrone is so vivid, compelling, and fully-realised. You're never left wondering "who's this again?" because with clever details, dialogue, and action, Bardugo shows you exactly who is who. They’re also very memorable. Alina is a terrific heroine. She's the definition of an underdog. Her grumpiness, pessimism, awkwardness, and general insignificance is refreshing, and I relate to her personality a lot. While in Book 1 she starts out as the unwilling "Chosen One", she reluctantly rises to the responsibility in Book 2 and undergoes strong character growth and development. Book 2 also finds her grappling with the pull of darkness and writhing under the Darkling's influence. In Book 3, she finally comes into herself. The rest of the cast is amazing, too. So are their friendships. Book 2 introduces the lead ensemble, and from then on we see a lot more of the colourful group: Tolya, Tamar, Genya, David, Nadia, and of course Mal and Nikolai. Ah. Nikolai. I'm sure you've heard of the privateer who's probably every bookworm's book boyfriend since the day he arrived on the page. Well, he's fantastic. Dashing, hilarious, smart, and the hero of the upcoming King of Scars. I admit, there are no two characters I'm shipping wildly in this trilogy. In the first book, it's a slight love triangle - Mal, Alina, and the Darkling - but since the Darkling's relationship with Alina is kinda abusive, it's really her and Mal who are the focus. They're friends, although Alina's always had a crush on him, and their relationship slowly develops into something more as he comes to acknowledge his own growing feelings for her. In Book 2, Nikolai enters the romantic scene, the Darkling's feelings for Alina intensify, and Mal and Alina go through a hang of a lot of relationship drama and angst. But Bardugo handles it well. Mal's a jerk at times, but Alina's hiding stuff from him. Nikolai wants Alina because of political diplomacy, but the Darkling wants her because of their shared darkness. It's a messy, but it's all well written. What I love most about the romance in this series is how Bardugo handles all the guys wanting Alina. It would be easy for her to fall into that trap of "all the male characters are falling over themselves for the perfect girl no one can help but fall in love with", but she doesn't. Because everyone is so flawed, and because Alina is so unpretentious, the romances feel human and down to earth (well, as down to earth as fantasy can be). It's not a matter of the Mary Sue everyone falls head over heels in love with. Thank goodness! Bardugo is a master at creating worlds. The one in this trilogy is Ravka, inspired by 1800s Russia, and it's dark, bleak, and deliciously atmospheric. With every book we get to see more of the world (Bardugo takes us to courts, towns, oceans, mountains, underground communities, and even misty graveyards) and every scene is lavish, rich, and seething with character. Haunting, Gothic, dangerous, and chilling - it's startlingly unique and vividly breathed to life. In Book 2, we also get to see a lot more of the politics and social structures in the culture. Have you read this trilogy? What did you think of it? Are you a fan of Leigh Bardugo? This week, I had writer's block. Thankfully it only lasted till Thursday, but that still meant that my Robin Hood retelling hit some major snags and is definitely not gonna be ready for NaNo. So I've turned back to my Peter Pan retelling. It actually works out well because I wrote the first draft of it for NaNo last year, and so this year it'll be the second draft. As annoyed and frustrated as I am about my Robin Hood story, I'm excited to go back to Peter Pan. Sometime in the future I will definitely go back to Robin Hood, but for now it's being pushed back. Not loving Spinning Silver, just started Lying To You, and re-reading Ruin and Rising. 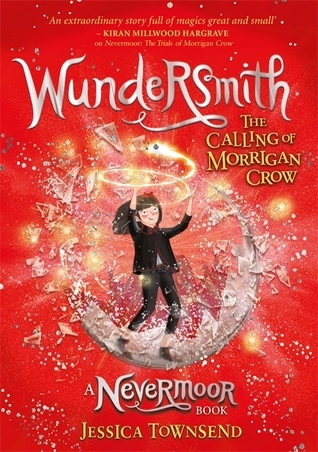 I received a beautiful hardcover of this book, which is the sequel to the magical Nevermoor. Can't wait to read it! How was your week? What are you reading and watching? 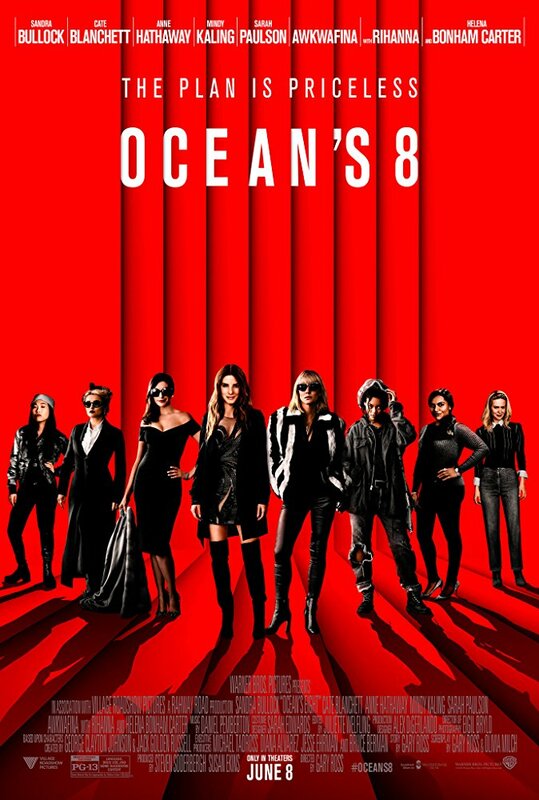 Cast: Sandra Bullock / Cate Blanchett / Mindy Kaling / Anne Hathaway / Sarah Paulson / Richard Armitage / Rihanna / Helena Bonham Carter / Awkwafina / James Corden. Content Advisory: PG13 for drugs, mild language, and some suggestive content. I have been ecstatic about this film since the day it was announced. Even when the critics didn't like it, I floated on a cloud of rose-tinted expectation. It just sounded too perfect to fail. The cinematography is brilliant, atmospheric, and very appropriate to the story and setting it explores. The soundtrack is punchy, and the costumes are absolutely divine. I love how each outfit is so thoughtfully chosen for the character wearing it - considering that the script doesn't give much in terms of character depth and development, the costumes are very much needed. They're colourful, elegant, and speak volumes about the characters' personalities. Each piece is entirely on point. The script is far from perfect. The writing isn't witty, particularly clever, or humorous, and as for the plot, there's very little tension or thrills. It lacks brilliance and intelligence. 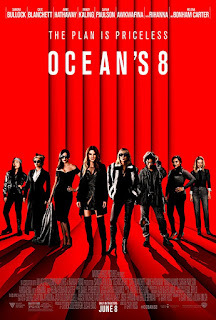 I also think that the "con within a con" aspect, which is to be expected from any good heist movie (and works beautifully in Ocean's Eleven), falls flat because it's sloppily implemented and rushed. I was never totally sold on the "big twist", simply because of the way it was executed. There's also no real threat, or at least there's not enough urgency. It's too casual. Obviously, the worst case scenario is that the characters go to prison, and yet that is never truly felt by anyone, except maybe with the exception of Debbie. The difference with her is that we're given her back story and we can feel sympathy for her because we know where she's coming from. With the rest of the characters, we don't actually see what they have to lose. Thus, the fact that they could be caught doesn't seem like a big deal. The acting is excellent. 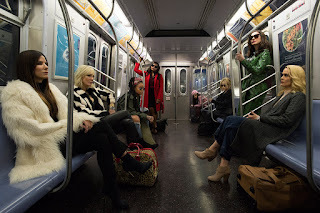 Sandra Bullock and Cate Blanchett are effortlessly slick and smooth, Cate Blanchett is easily my favourite of the cast, and that restaurant scene between Debbie and Lou towards the start of the film is superb; when Blanchett asks "Why do you need to do this?" and Bullock answers 'because it's what I'm good at", I got goosebumps. The script is weak, but it's their delivery of the lines that makes the scene so powerful. Unfortunately, though, the characters aren't well written. No one is three-dimensional, no one has any real depth, and the characters are pigeon-holed into their roles in the heist. There's the hacker, the fence, the jeweller, etc etc, and even the hints of backstory and personality we get to see aren't substantial. It's a huge waste; the actresses clearly have the range - now give them something with which to work. 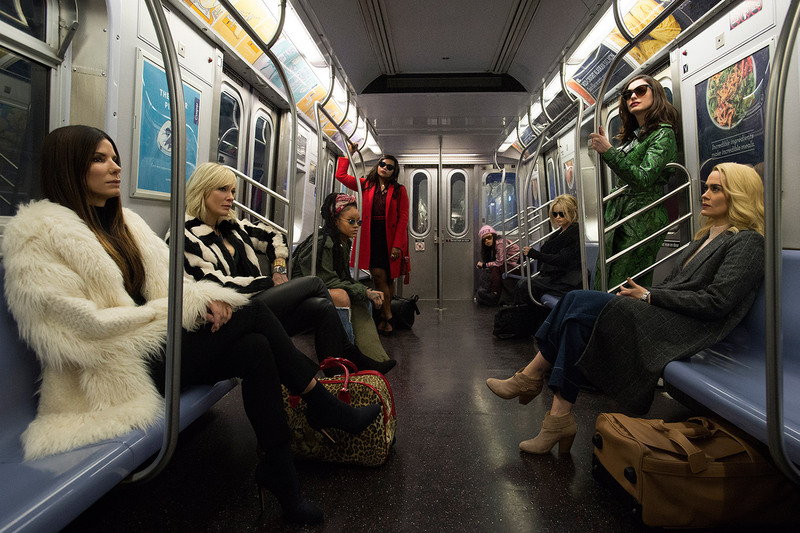 Not even stunning visuals and wonderful female leads can pull off Ocean's Eight. It's a con without thrills, smarts, and urgency, which makes it nothing more than a casual action flick. 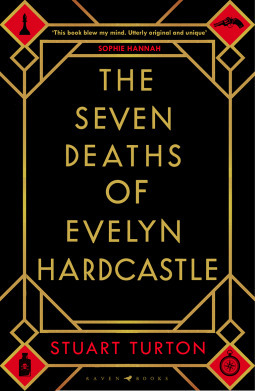 THE SEVEN DEATHS OF EVELYN HARDCASTLE - Stuart Turton. Published: February 2018 - Raven Books. Triggers/Content Advisory: Gory descriptions / violence / mild sexual innuendoes. How do you stop a murder that’s already happened? 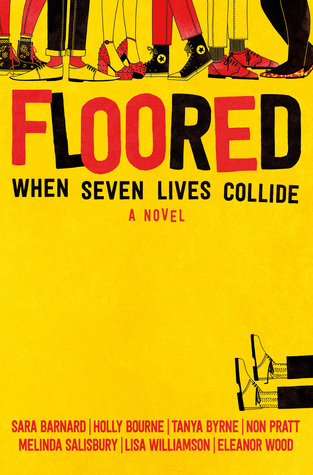 At a gala party thrown by her parents, Evelyn Hardcastle will be killed--again. She's been murdered hundreds of times, and each day, Aiden Bishop is too late to save her. 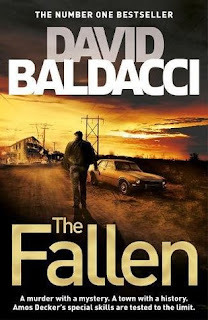 Doomed to repeat the same day over and over, Aiden's only escape is to solve Evelyn Hardcastle's murder and conquer the shadows of an enemy he struggles to even comprehend--but nothing and no one are quite what they seem. At first I wasn't in love with Turton's writing because the sentence structure felt long-winded and awkward. But as the story continues, it definitely smooths out. Before long I was utterly enamoured with the prose - the vivid details, the excellent dialogue. To give you an example: "The evening meal is lit by candlelabra and beneath their flickering glow lies a graveyard of chicken bones, fish spines, lobster shells and pork fat. The curtains remain undrawn despite the darkness beyond, granting a view toward the forest being whipped by the storm." It's all incredibly immersive and tangible. Speaking of which, the story is also so atmospheric. It's Gothic, very dinner-party Agatha-Christie-esque. I wouldn't recommend reading the book in short sessions with many intervals between, because to really get into the story, you need to give yourself time to be immersed. Then you can truly appreciate the lush, haunting setting, and the beguiling sense of foreboding dripping from each scene. It'll totally absorb you if you give it a chance. The plot is brilliant. There are a ton of twists, many layers to the story, and the author is a genius. However, it is confusing. You really have to concentrate and you can't afford to switch off - even for a second. I tried my best, but by the end I was still a bit bewildered by the actual mystery. It's a lot to take it and a lot to retain from start to finish. ❝ What does a child who has everything want?" ❝ Every man is in a cage of his own making." ❝ What kind of mind makes theatre of murder? The cast is big, but everyone is vivid, colourful, and extremely compelling. They're all hiding something, and they're all anti-heroes and anti-heroines wearing metaphorical masks. It's sublime. Initially, I was concerned that the protagonist changing persons every few chapters wouldn't work, but the author handles it so well by fleshing out each personality and making their point of views distinct. In the hands of someone else, it could have been a train wreck. But Turton handles it thoughtfully and carefully. 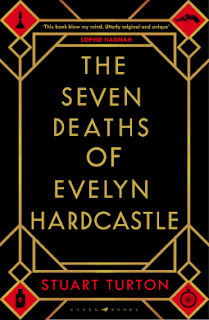 The Seven Deaths of Evelyn Hardcastle is a mesmerising Agatha Christie-type mystery. It might take you a while to get into it, but if you stick with it for long periods of time, you'll soon be drawn into the spellbinding world of these illusive characters. As usual, I'm writing this post on Friday, and right now I am so so happy that the week's over! I'm exhausted - writing has sapped my energy and staying up past midnight every night hasn't helped either. But at the same time, I feel like I've accomplished a fair bit this week. I have done so much outlining and work on my WIP (which includes a heck ton of re-outlining and fixing stuff as well) and I've even gotten back into bookstagram photo-taking. Hopefully that lasts! Ha. I'm buddy-reading Spinning Silver with Di, but otherwise I've hardly touched a book this week. Today I wanted to write a post about mental health - specifically mental illness - because it's International Mental Health Day. It's been a hard post to write, and I've deleted and altered and rewritten a number of times. I've also been back and forth about whether I should actually post it. In the end, here it is. Mental illness is still considered by many to be a stigmatic subject (although definitely not as much as it used to be). Personally, I often feel silly and embarrassed talking about my anxiety, because it shows a vulnerability with which I'm extremely uncomfortable. Worse, some people just assume you're overreacting, and worse still, some are unable to comprehend how difficult some things might be for you because they've never ever felt the same way. You might feel stupid, like there's something wrong with you, and you begin to wonder if maybe it is all inside your head, that maybe you are being silly and overreacting. Too often, I feel like that. And so let me tell anyone who's listening: YOU ARE NOT SILLY AND YOU ARE NOT OVERREACTING. You are brave. You are strong. It's unsettling to share your experiences, especially on the Internet, because you're surrounded by judgement. Yet, I think it's important we do. We need to show that mental illness is nothing to be ashamed of. The more people talk about it, the more we can help each other. That's why I think it's so important that people are given the opportunities and support to be vulnerable, to share their stories, that there's mental health rep in books and films, and that people are believed and supported and valued through their personal struggles. It's also easy to think that you shouldn't share your story because your anxiety or your mental illness might seem so insignificant compared to someone else's; to the detailed testimony you read online from a blogger or see on Instagram or Twitter. But honestly, I believe that kind of thinking is toxic. It's not a competition. No story is too small. It takes a lot to share your story, and I believe it's important that people realise we are not doing this for attention. You, your experiences, have value. Whether you share them or not is entirely up to you, but it is not something you should ever feel guilty or embarrassed about. Talking about my anxiety and depression is difficult. It's extremely personal. I have an anxiety disorder and suffer from moderate depression. I over think every little thing and stress to the point of feeling physically sick; my limbs sometimes jerk involuntarily if I'm anxious; and I burst into tears and hyperventilate and get panic attacks when I'm extremely anxious. I worry about the future, I worry about failing at everything I ever do, I worry about writing and blogging and eating and relationships, I worry about my identity and my capabilities, or lack thereof. There's nothing romantic or idealistic about it. It's scary, it's overwhelming, and often I lack the motivation to climb out of the pit I'm in. It's a twisting, writhing mess inside of me. It's suffocating. I hate feeling helpless, and I hate that feeling of inevitability. I often feel stupid. I hate myself for stressing, for feeling so low, for having a panic attack about something that appears so simple and so easy for other people. I'd give anything to turn it off. I know that things could be so much worse for me. Of course they could! I am so, so grateful that I'm not facing what some other people are facing. But I think it's important that these experiences are shared, regardless of apparent severity. Because that's what this is about. It's about throwing off the stigma of mental illness. The wonderful thing about having a Lord Jesus is knowing He's in control. However dark it is inside your head, however overwhelming life and relationships and the world may be, He is there. That doesn't mean I don't worry, that everything is immediately alright, but it does mean I have hope and that I can - with His help - hand my worries over to Him. It is not easy, but it's not impossible. And it makes such a difference when I do. That encourages me. Below are some particular Bible verses I find comforting. I hope you do too. "The righteous cry for help, the Lord hears and delivers them out of all their troubles. The Lord is near to the brokenhearted and saves the crushed in spirit. Many are the afflictions of the righteous, but the Lord delivers him out of them all. He keeps all his bones; not one of them is broken. " Getting professional help and taking medication is nothing to be ashamed of. I hope mental illness continues to be talked about, so that people are supported and understood through what they're dealing with. It's been a weird week! I finally mustered up the courage to ask my local dvd store about getting a job there, but unfortunately they said there aren't any vacancies as of yet. It was disappointing, but honestly I'm just glad I asked. I was so anxious beforehand. I also started watching a new TV series (Heartland) - it's got 11 seasons though, so I was just hopping around random episodes because I do not wanna watch all 11 seasons, especially since it isn't actually a good show. The writing is terrible, as is the acting, but it's also relaxing and fun, which is why I stuck with it. Now, however, I'm back to Gilmore Girls :) Yay! I've been doing a lot of writing prep this week. No actual writing the story, but a ton of outlining and character arc work etc etc. I ran a Twitter poll asking for help deciding which WIP I should focus on (since I'm notorious for trying to write multiple stories and characters at once and it never ends well), and thanks to the poll, I'm now only working on one: my female-centric Robin Hood retelling. More info about that closer to NaNo! I made very little reading progress this week. Netflix and my writing have consumed my focus. So how was your first week in October?! And what are you busy reading and watching? Classics aren't for everyone. Personally, I love them. There was even a time when I would only read classics. Thank goodness I eventually branched out. Below are some of my favourite classic novels and ones I highly, highly recommend. Even if you're not a big classics fan, maybe give them a go! You could be pleasantly surprised. This book. Guys. This book. I'd recommend it especially if you're not a big classics fan, because honestly, it doesn't read much like a classic. It's fast-paced, utterly compelling, and will leave you smiling with a warm and fuzzy feeling inside of you. The goings-on in this little English town will hook you from start to finish. It's amazing. The TV series is also excellent, if you wanna give that a watch. Don't let the sheer volume of this book intimidate you! It's an epic for a reason. It's so incredibly profound, and the characters are rich and enticing. Some parts are boring (the many many descriptions of the war are - *yawn* - too much) but the characters' interactions and relationships are where this novel truly shines. I cried a lot reading this story. It's gorgeously, sinisterly romantic, and Wilde's writing is excellent. The tragedy will break your heart - it's so bittersweet and creepy and horribly hopeless - but wow; what an incredible, impactful tale. This book is Gothic romance at its very best! The atmosphere will consume you, the characters will bewitch you, and the setting will lure and trap you. I love how fast the story moves and how twisted the relationships are. It's also a short book, so you can probably finish it in a day. I used to hate Austen's novels, but this book turned me around. I'd adored the Kate Winslet movie version (IT'S ONE OF THE BEST AUSTEN ADAPTIONS EVER, SO GO WATCH IT) and that's why I decided to give the book a chance. I ended up loving it. The story and characters are so rich and their relationships are irresistible. Everyone sings the praises of Pride and Prejudice, but for me, Sense and Sensibility is the best Austen work. Have you read any of these classics? What did you think of them?